This brings so much enjoyment to your dog and you’ll be smiling for a long time after you finish your online chat with your fur baby. It definitely brightens up your day. The Furbo is a dog camera treat dispenser that lets you to talk to your dog with the two-way audio and it lets you remotely toss a treat to your dog. The best thing about the Furbo is that it tells you when your dog is barking or crying. This can really help to set your mind at ease if you’re away from the house and your dogs are alone. The worst thing about leaving your dogs at home, is not knowing whether they’re safe and happy. The Furbo has a 720p HD camera with 120° lens which works day or night. You can take photos and record video on your smart phone from the Furbo. Is this dog camera treat dispenser good for small dogs? The Furbo is great for all sizes and breeds of dogs. The treats are limited in size so obviously you can’t give a huge amount of them to a larger sized dog. But they are only meant to be treats, not a meal. Any sized dog benefits from hearing your voice through the Furbo. You can calm your dog down when they need it. If your dog suffers from separation anxiety you can calm them remotely and throw a treat to really distract them. It really will make you smile being able to toss out the treat and see them happy even while you’re at work. Will the camera work at night? Yes. The camera on this dog camera treat dispenser is top notch and it even works at night and in low light. With a built-in infrared camera lens it is perfect for all times of the day. Yes. The feature I like the most is the push notifications that are sent to you when you dog barks. If your dog is upset or injured and they bark, you’ll know about it even if you’re away from the house. Obviously, if your pet is bored, it is fun to be able to toss them a treat to keep them busy. But if by some chance your dog is injured or sick it is so important to be able to see them on the camera and hear them barking or crying so you can go to them or phone for help. How does the Furbo connect to the internet? The Furbo dog camera treat dispenser runs on your house wifi. Most people don’t have a problem connecting it but a few have needed to get a wifi extender because their wifi signal is too weak. It depends where you want to place your Furbo. If your signal is weak you may be thinking about buying a wifi extender anyway, to use for other devices in your home. It is just something to keep in mind. Can I use my own treats? Yes. The information about Furbo says that treats should be about half an inch in size. But actually to be exact the treats need to be 0.4 inches in size to work properly and shoot out of the Furbo dog camera treat dispenser. One of the dog treats that works well with the Furbo is the Natural Balance Mini-Rewards Semi-Moist Dog Treats (Click Here to see more details). You can actually use any treats you like so long as they are the right size and not too compressible. Can more than one family member log in to Furbo at once? Yes. Two people can log in at the same time to the Furbo dog camera treat dispenser. You can only have one account with one login password but you can have two people logged in at the same time. The only real restriction with two people on Furbo at the same time is that you can’t both shoot the treats out at the same time. Who would benefit from owning the Furbo dog camera treat dispenser? If you leave your dogs at home to go to work, you’ll love the Furbo. It can be worrying leaving your dogs at home alone. The Furbo gives you peace of mind. The Furbo is also great if you’re going away for a weekend and you know someone else is coming in to check on them and feed them. Obviously if there is no one with them for most of the time you’ll be concerned. 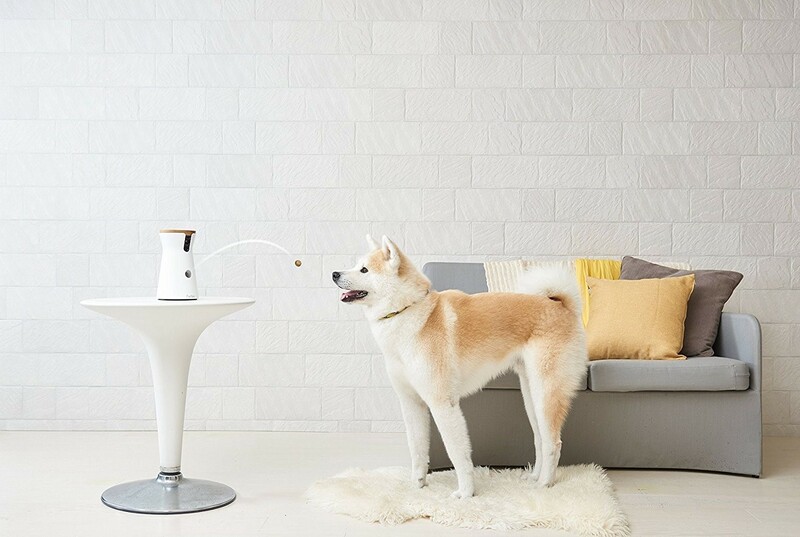 The Furbo dog camera treat dispenser lets you see and talk with your pet while you’re away. If your dog has an illness, injury or disability you’ll be delighted with the Furbo. It lets you monitor the safety of your dog when you’re not at home. We can’t always be at home all the time. The Furbo can let you see if your dog needs you urgently. And, as already mentioned, the text alerts when your dog barks are invaluable. Everyone in your family will love the Furbo. Your dogs will be happier and you’ll have peace of mind knowing you can see them at any time. For the price, you get a high quality dog treat camera that lets you interact with your dogs at any time of the day or night. Enjoy the fun of tossing treats to your fur babies. It will put a smile on your face. This dog camera treat dispenser provides two-way audio so you can both hear and speak to your pets. The biggest advantage the Pawbo offers over and above the Furbo is the laser pointer game. This may appeal to your dog. Obviously the laser game is designed for cats who mostly love it. But I do know of some dogs who enjoy it too. If you have both cats and dogs that need to be entertained during the day, you’ll love having the laser pointer game which you operate from your smart phone. The Pawbo has a drawer for refilling treats. There are 9 sections in the drawer. Obviously the treats need to be fairly small but you can decide on how many little treats in each section, between about 1 and 3 depending on the treat. The largest treat you can fit in this dog camera treat dispenser would be ¾ inch. With the 9 compartments, this means you can dispense treats 9 times before it needs refilling. This is usually sufficient for a day’s work hours. Especially if you have a small to medium sized dog. Does this device work with all smart phones? There is one possible disadvantage with the Pawbo. It works great with iPhone but if you’re a Samsung Galaxy owner, it has some problems with S7. It will work, but you may have difficulty hearing your pet through your phone. If you’re an android user, I’d go cautiously with this dog treat camera. You may be better off buying another brand of dog camera treat dispenser. As mentioned, there is a two-way speaker so you can hear your dog as well as speak to him. You can dispense treats to put a smile on your face and make your dog happy. Will this dog camera treat dispenser notify me when my dog barks? No. Unfortunately that feature is no available on Pawbo. You need to log in and check on your dog and use the ringtone (various sounds to choose from) to attract your dog towards the camera. If you need this feature, the Furbo is the best dog treat camera for you (see the details above). Can I save photos from the Pawbo? Yes. 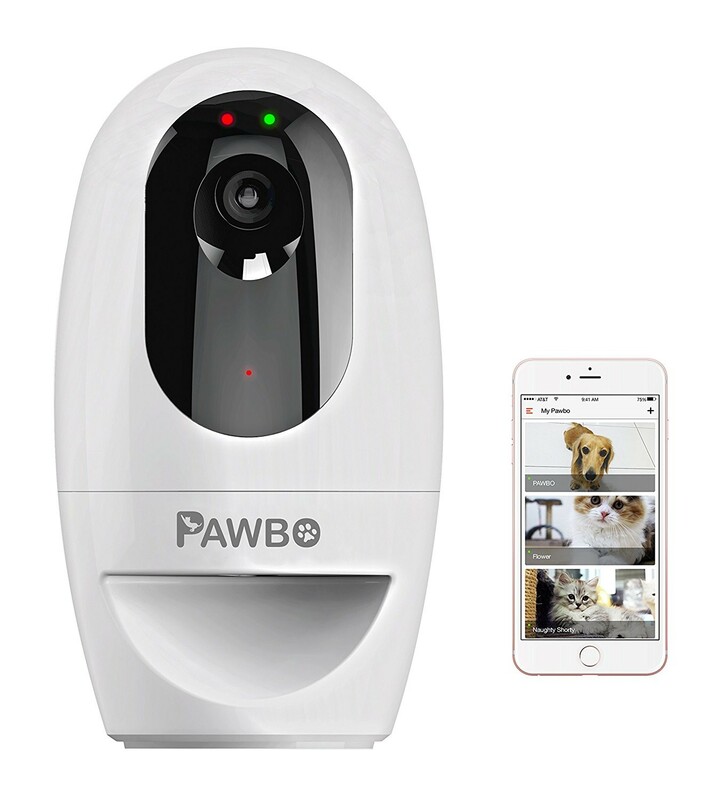 With the Pawbo, you can take still photos or record videos on your smart phone from the Pawbo. Use these later to save memories, post online or share with friends and family. Photos can be shared on social media straight away. Videos can be stored on Google Drive or Dropbox. Does the Pawbo camera lens tilt? No. The 720p HD live streaming camera has a 130° lens. Although the lens is fixed, it does have a 4x digital zoom feature. If you need a tilting or panning camera, this one is not for you. The Pawbo does not have low light vision. If you need this feature, see the Furbo above. The Pawbo is wall mountable and in the alternative can sit on a flat surface like the floor or a table. If you have a large dog who is going to be overly-inquisitive with the device, it is recommended you wall mount at a height higher than the dog’s reach. There are multiple ringtones on the Pawbo to get your dog’s attention. When you log in, you use a ringtone to bring your dog running to the dog treat camera. Your pet will hear your voice and you can dispense a treat. You can choose the ringtone to suit your dog. 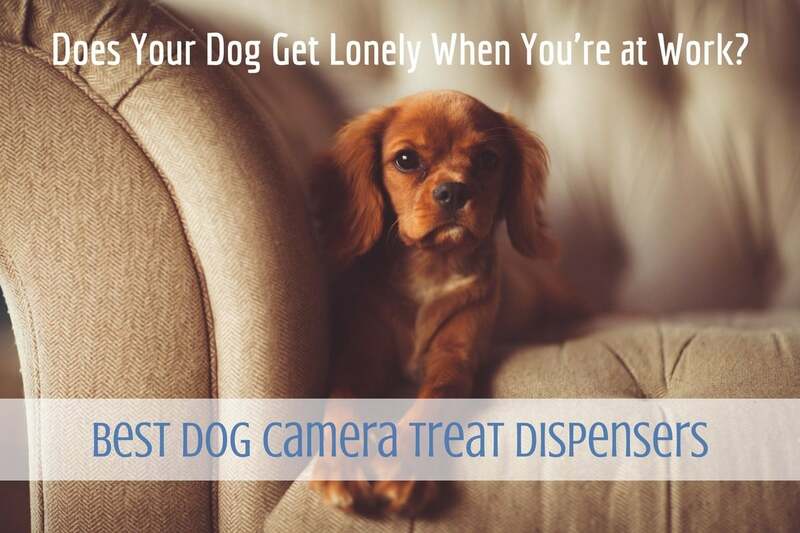 There are no memberships or monthly fees associated with the Pawbo dog camera treat dispenser. You simply buy it and you get free access via an app on your phone. Just to confirm, there are no monthly fee for the ability to record the video either. This dog camera treat dispenser has a speaker for your dog to hear you talking but no microphone, so you can’t hear your dog. You can see your dog and dispense treats but there is only one-way audio. Using the free app on your smart phone you can see and speak to your dog any time you’re out of the house. There are no ongoing fees associated with viewing the live video from Petzi. With the Petzi dog treat cam you can snap photos on your smart phone from the Petzi to save or post on social media straight away. Unfortunately you can’t record any video. There is no night vision on this dog camera. If you need vision in low light, see the Furbo (details above). The lens on this dog treat camera is fixed, it cannot move side-to-side. But it has a fairly wide angle and you can usually see a whole room at once depending on where you position it. Yes. 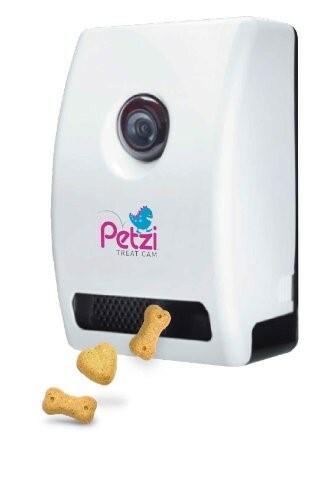 The Petzi dog camera treat dispenser can take 1 inch treats. It holds about 20 treats at a time but you can’t control how many are released. It may be more than one each time you dispense the treat. The treats need to be dry crunchy treats, the same as most other dog treat camera devices. If you use the Milk Bone Mini’s dog treats which are 1 inch long but quite thin, you can fit about 100 in the dispenser. Do I have to place it on a wall? The Petzi can be wall mounted or it can sit on a flat surface. Of course, it needs to be plugged in to an electrical socket and be within wifi range. Does it have a sound or motion sensor? No. This dog camera treat dispenser does not provide barking notifications. You will need to log in to see your dogs. There is a chime which alerts the dogs to the camera turning on and, of course, your voice will be heard when you call them. There is only one chime sound, you don’t have a choice of ringtones. If you need a pet camera with a motion sensor you may need to use a wifi security camera or nanny cam. At this stage there don’t appear to be any dog treat cameras on the market with this functionality. This may change in the future. Can two people log in to the Petzi? Yes, as long as you give the other person your password you can each log in to see your dog and release the treats. There is no limit on how many people can each use their smart phone at different times to access the Petzi, so long as they have the password. However, it doesn’t allow you to log in at the same time. If one person is on it live, they will be disconnected so the next person can access the Petzi dog camera treat dispenser and release treats. ☑ Learn how to clip a dog’s toenails at home. Read here for the safe way to do it.